January: Feed the birds . . . Okay, so we were planning on attracting seed-eating birds, not bird-eating birds when we put up this feeder. But if you build it, they will come. 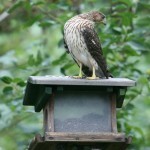 Sharp-shinned hawks and Cooper’s hawks visit our feeder in order to hunt the smaller birds that visit our feeder. These two types of hawks can overlap in size. 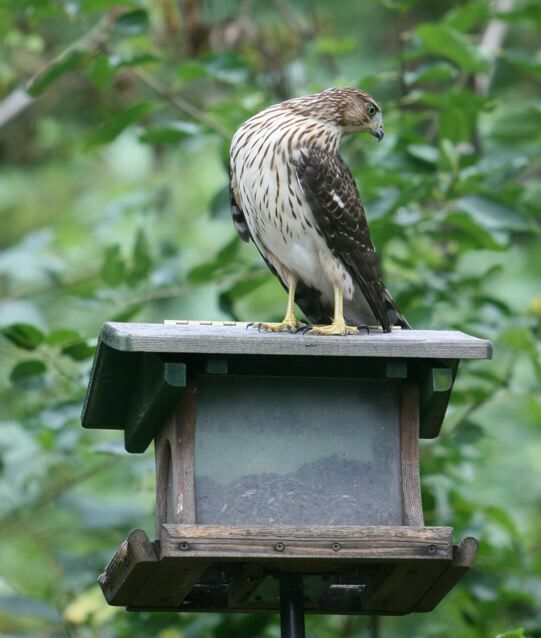 But the generally bigger ones are Cooper’s hawks. The smaller ones are sharp-shinned hawks. This one appears to be a Cooper’s. The hawks are beautiful to watch. But I am always hoping they will not eat my favorite songbirds!